You will be the belle of the ball (picnic!) when you serve this fun dessert! 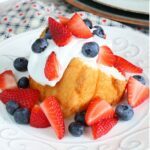 There is a slight twist with this Patriotic Shortcake, though, compared to traditional shortcakes. This recipe uses a fresh and light coconut whipped cream in place of the typical dairy whipped cream. Wash and thoroughly dry the 2 containers of berries. Cut strawberries into bite-sized pieces. Mix strawberry pieces with blueberries in medium-sized bowl. Set aside. Remove the chilled can of coconut cream (or milk) from the refrigerator. After you open the can, you will see that the coconut cream (fat) is hardened and has separated from the coconut water. Pour the coconut water out of the can into a glass to use in other recipes (smoothies, detox drinks). Then scoop out the hardened coconut cream (not any of the coconut water) into a bowl and beat with a hand mixer or stand mixer. Whip the coconut cream until it is smooth and fluffy. Add ½ tsp vanilla extract to the whipped coconut cream and beat a few seconds until incorporated. Place whipped coconut cream in refrigerator until ready to use. It will firm when chilled and soften at room temperature. Remove angel food cake from the container and place on a large plate, gather the bowl of berries and whipped cream and now you are ready to assemble. Place a slice of angel food cake on a small plate, top with a dollop of whipped coconut cream, and add a spoonful of berries to finish this festive dessert. Enjoy! I prefer using canned coconut cream to make whipped cream. However, if you cannot find this you can use canned coconut milk. The coconut cream has a higher cream to water ratio and produces more whipped cream than a can of coconut milk. If you are using coconut milk, please use 2 cans to have enough whipped cream for the dessert.